Anyone that knows of the staunch rivalry between Intel and AMD would have found themselves wondering what the world is coming to with the announcement coming out of Intel’s Newsroom recently. Intel is partnering with AMD to offer, “unique-to-Intel”, discrete graphics for power users that want the convenience of ultra-light, ultra-thin laptops with the benefits previously only available in much bulkier laptops. Intel’s new Embedded Multi-Die Interconnect Bridge (EMIB) offers a way to pack more technology into a smaller space, both laterally and vertically, removing previous latency, and size constraints. While Intel clearly sits at the pinnacle of CPU performance, AMD powers all top-end, modern consoles (PS4, Xbox), and their mobile graphic solutions are superior to anything in Intel’s current arsenal. 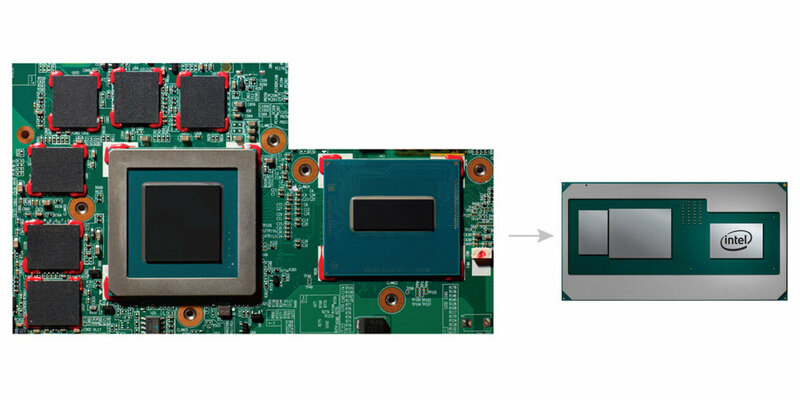 Intel plans to utilise AMD’s Radeon solution with second-generation High Bandwidth Memory (HBM2), which has a much smaller form-factor than traditional DDR memory, lower power consumption, and much higher bandwidth. This will mark the first consumer-grade product utilising Intel’s EMIB technology, having been first implemented in their Stratix 10 FPGA, brought about by their $16.7 Billion acquisition of Altera towards the end of 2015. There has been speculation whether Apple pushed Intel and AMD to form this partnership given that Apple itself uses Intel’s processors, and AMD’s discrete graphics. Using Intel’s EMIB technology enables a lower profile, which would allow Apple to reduce the profile of their MacBooks significantly. This is just speculation, however. As with any laptop offering discrete graphics, and given the premium already paid for Ultrabooks, do not expect this new offering to come in at a budget. Read Intel’s press release here. If you are interested in a better understanding of Intel’s EMIB technology, you can get it from the horse’s mouth here.